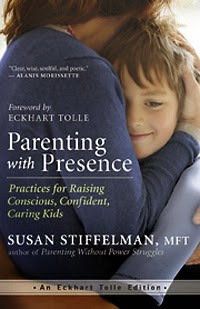 For a couple weeks I've been reading and re-reading Susan Stiffelman's new book titled "Parenting with Presence: Practices for Raising Conscious, Confident, Caring Kids." One day I read something that was a game changer for me. I took the information in, and let it sit, processing it mentally and emotionally before sharing with my hubby. "I read something yesterday that blew my mind." "What!? You've waited a whole day to tell me!?" "Yep, I needed to process it." It was something so seemingly simple and obvious, but I'd never thought about it the way Susan presented it. And that is the core and beauty of her new book: It presents simple yet mind blowing stuff that if taken into practice is sure to change the way you view parenting, your children and life. While reading her entire book, I felt like I was sitting on a comfy sofa in a sunny, warm room with her right in front of me, conversing and listening to me. Her writing style and the wisdom and advice she shares is as if you were having a one-on-one session with her (well, at least it was for me...I'm a Pisces with a vivid imagination!). But the point I'm trying to make is that unlike some other parenting advice books that talk down to parents, telling them what they should do, Susan offers insights and opportunities to gain self awareness so that we can become better parents (and people) from the inside out. This is the perfect time to confess that for the past few months I've been feeling burnt out. I've had enough of the battles that happen every day with the kids to do their schoolwork. I'm tired of having to clean up after the 3 year old's messes that she seems not to learn to stop doing. And I'm tired, oh so tired, of having to put my needs last. 1. (This is the thing that blew my mind and took me a day to process before telling my hubby). I tell my kids I love them every day, several times a day. But I don't think I had been making a point to consciously show them. And this made me feel sad. I realized I'm so dependent on multitasking, and actually prefer to escape from certain moments by going on my phone or computer. Susan explains that when you take some time to be totally present with your children, it lets them know you like them, you like spending time with them, and you enjoy listening to what they have to say. She does a way better job at making the point. But what finally dawned on me is that if I express my acceptance and love with my actions and most importantly, my total presence, my kids will be more willing to comply to requests without battles. I've tried it out for the past few days and WOW, it really does work. I know it's hard for some parents to get down and play with the kids. But I'm sure we can all find a way to connect with them. It doesn't have to be the same for everyone, just find something you can do together for a while and give them your FULL presence (no phones, screens, facebook or taking pictures). Think of the last time you had that sort of interaction with someone. It feels good to have that full connection with someone, right? It doesn't happen as often as it should and it leaves us feeling frustrated when we are trying to tell someone something and you know they are distracted on their phone or doing some other task. I know I get bitchy with my hubby if I think he's not listening to me. So I can relate to how the kids feel if I'm seemingly playing with them but actually I'm writing a grocery list or checking my email on the side. Gosh, I even try to do something while breastfeeding my baby, even though he doesn't nurse for long. I finally realized the message this is sending my kids. Don't get me wrong, I know as parents we have things we need to get done. But I get it now: when you have those moments of time with your kids when you really don't need to be doing anything else, give the moment, yourself and them your full presence. It is one of those things that will pay in dividends. "Children don't want to be in charge, it's just that they know somebody has to be, because they understand that life is not safe unless someone competent is behind the wheel (Parenting With Presence, pg. 51)." I need to keep reminding myself to see things as: if it's not an emergency, don't freak out. And even in an emergency, freaking out wouldn't help. Things will be clearer and calmer if you just stay present. Two other things you need to know about this book. The first is that it does have ideas and insights that have to do with mindfulness, ancient eastern wisdom...you know, the sort of stuff in "The Power of Now." For me this is fantastic because I love that stuff...it's right up my alley! I'm only mentioning it so you aren't surprised. If you aren't into that stuff, I still think you should give it a chance because from cover to cover the book is amazing (and I'm seriously not even joking here). If you have ever felt like a bad parent, have a kid who has tantrums, have a kid who pushes your buttons and triggers you, have a kid who loves (or is addicted to) screen time, have a kid who is stressed...or actually, if you have kids period....this book will have at least one thing you can take home that will help you and your relationship with your kids. The second is that while it's an amazingly well written book that you can read within a few days, it's not an easy read. What I mean here is that you can't just expect to read it and that's it...voila all will be great. No, if you want it to help, you're going to have to be willing to do some soul-searching of your own. But this isn't a negative thing. In fact, the more you know about yourself, the better you'll be able to get to know the kind of parent you are and that can only help in the end. At the end of each chapter there are reflections and questions to ask yourself as well as ways to implement the main points of that chapter into your daily life. I tell you, Susan does not leave you hanging. She's got your back the whole time. And that's why I felt I was in a one-on-one session with her. If you want your own copy NOW, head on over to her website or Amazon. And here is a short video in which Susan Stiffelman talks about the 3 takeaway messages from her book. P.S. Happy Mother's Day to all the Mamas out there!